“Yes College” has ranked Ivy Coach website as one of the best college admissions resources on the Internet. We appreciate the nod of approval. 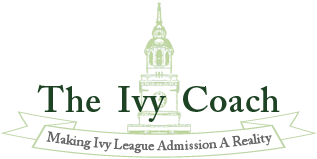 Ivy Coach website, featuring the single most informative and visited blog on highly selective college admissions that you’ll find anywhere, has been ranked one of the top college admissions resources on the Internet by “Yes College.” This of course is not the first honor our college admissions blog has received over the years. For the last many years, there have really been only two college admissions blogs worth reading. One of them you’re reading right now and the other was “The Choice” blog of “The New York Times.” Jacques Steinberg and Tanya (Caldwell) Abrams contributed an enormous amount of information on college admissions over the years on “The Choice” to help better educate students and parents on the admissions process. A couple of months back, “The Choice” blog ceased publishing new material. It was the end of an era for one of the best resources anywhere on college admissions and we at Ivy Coach saluted Jacques, Tanya, and all of the folks who contributed to that blog over the years. When “The Choice” called it a wrap, that left one hugely popular college admissions blog standing. Ours. We hope that you find all of the information that we put up every day informative. We hope that it helps you understand aspects of the highly selective college admissions process. And we hope that it makes you a little bit less stressed. You should probably also know that we keep the vast majority — if not all — of our secrets off the blog. At the end of the day, we love providing free information to people across the world. But we are a business.